We are installing the above flooring. What pitch blade do you recommend using for cutting the flooring. Hello Marcymarc and welcome to the Community. You can use a table saw, miter saw or circular saw to cut the laminate flooring. In order to get a smooth board edge with no jaggedness, it is advisable to a use saw blade with at least 60 teeth. 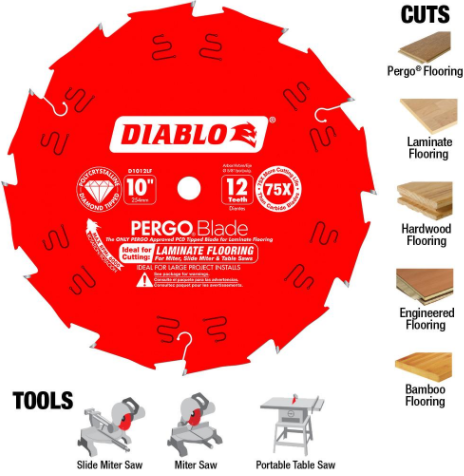 Several manufacturers make a SAW BLADE designed specifically for cutting Laminate flooring. I am not sure what you mean by pitch blade but I hope this helps you choose the correct type of blade. Click HERE for a circular saw buying guide. If I have not answer your question please let me know.